At no time in our history have Americans been more concerned about their food supply. With an increased uncertainty about what goes into our food, we've witnessed a growing interest in foods that are fresh, local, organic, sustainable, gluten-free and the list goes on. Yet, the biological foundation of our food supply is profoundly at risk. The Food and Agricultural Organization of the UN estimates that 75% of the world’s crop diversity disappeared between 1900 and 2000. The erosion of genetic diversity in agriculture continues, and along with it, we are losing not only culinary and cultural traditions associated with foods but the biodiversity we need to withstand uncertain climatic conditions in the future. 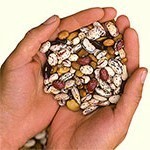 Seed diversity is the foundation for sustainable food security. Please, make a tax-deductible gift to support the work of Seed Savers Exchange. With your help we will collect, store, regenerate and distribute thousands of seeds and connect farmers, gardeners, and chefs through the world’s largest grassroots seed exchange. Your support will also enable us to offer education programs that teach the vital practice of seed saving to more people. Thank you in advance for supporting our work.